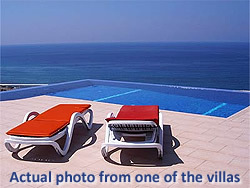 SeaCliff Village is one of the best properties listed in Cyprus44 property reviews. SeaCliff Village is a new development close to the beaches at Esentepe, one of the most popular locations for villa ownership in North Cyprus. Thanks to the fast and efficient coastal road, and the new mountain cut-through road, access to Kyrenia, the Karpaz Peninsula and Ercan airport is faster and easier than even before. Despite this easy access, the countryside around Esentepe still retains its sense of peace and quiet, and the great beaches near to SeaCliff Village are gloriously uncrowded. SeaCliff Village has been created by a group of building companies with international experience in both residential and commercial developments. The development team also includes international architects, ensuring both a high quality of deign and construction. Two types of villas are available at SeaCliff Village - the F-type and G-types. F-type villas at SeaCliff Village are perfect for those who want to make the most of the sweeping views down to the Mediterranean Sea. The downstairs living room has floor to ceiling glass sliding doors, and upstairs, the bedrooms also have full-length windows leading onto a large terrace, complete with shiny chrome railings. These large windows not only make the most of the views, they also flood the villa with light during the winter months. Even the back doors onto the decked pool areas beside the swimming pool are glass, for a modern, bright, almost nautical feel to the villa. On the ground floor, the living space is open plan, so the kitchen and living room flow together and make the most of the light through the tall sliding glass doors. So, it's perfect for preparing delicious meals and then simply walking through the doors to dine on the terrace. In the winter months, the large glass doors let light flood in to the space, so you can relax by the open fire and still see the sea! Also on the ground floor are two double bedrooms, both with en-suite bathrooms, one with a shower and one with a bath. On the first floor is a large master bedroom with en-suite bathroom, including double sinks, with access to the spacious balcony, perfect for lazy mornings in the sun or watching the sun go down with a glass or two of wine. Here, too, is a double bedroom enjoying its own uninterrupted views to the sea. G-type villas at SeaCliff Village offer the same floor to ceiling glass doors and windows, but with even more space and luxury. With its sleek design and smart lines, the G-type villa is especially striking by night, perfect for enjoying the wonderful warm North Cyprus nights on your terrace or balconies. On the ground floor, the large living room area has sliding glass doors on no less than three sides, offering unparalleled views and access to the sunny terrace. The fitted kitchen nestles in the corner of the living space as a separate room, yet with easy access to the living area, so whoever is cooking is never left out of the conversation! There are also two generous double bedrooms and a bathroom, and to one side is a generously-proportioned swimming pool, surrounded by smart, wooden decking. For an extra touch of luxury, you can even opt for a cascading swimming pool design. Upstairs, the villa offers two superb bedrooms, both with en-suite bathrooms. The master bedroom has windows opening onto its own private balcony, and a large en-suite bathroom with bathtub and double sinks. The second master bedroom enjoys access via its own sliding doors to the large upper balcony, offering wonderful views. Unlike many other villa designs, you can access this upper terrace through its own door off the internal staircase, so you can reach the terrace without having to go through a bedroom or up an external staircase. As you might expect from such a striking and elegant development, many villas have already been sold, but there are still sea view and front line villas available in good positions on this elevated site. 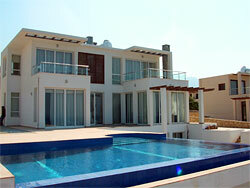 Prices for both types of villas start from as little as GBP149,000. No posts found related to SeaCliff Village. This web page is served on 19 April 2019 at 23:17:21.